The thrilling adventure of Lady Trent continues in Marie Brennan's The Tropic of Serpents . 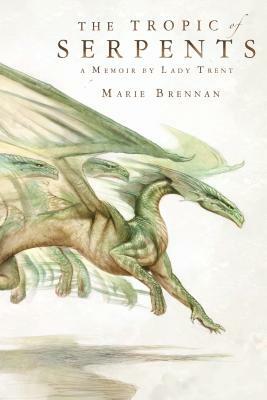 . .
Attentive readers of Lady Trent's earlier memoir, A Natural History of Dragons, are already familiar with how a bookish and determined young woman named Isabella first set out on the historic course that would one day lead her to becoming the world's premier dragon naturalist. Now, in this remarkably candid second volume, Lady Trent looks back at the next stage of her illustrious (and occasionally scandalous) career. Three years after her fateful journeys through the forbidding mountains of Vystrana, Mrs. Camherst defies family and convention to embark on an expedition to the war-torn continent of Eriga, home of such exotic draconian species as the grass-dwelling snakes of the savannah, arboreal tree snakes, and, most elusive of all, the legendary swamp-wyrms of the tropics. The expedition is not an easy one. Accompanied by both an old associate and a runaway heiress, Isabella must brave oppressive heat, merciless fevers, palace intrigues, gossip, and other hazards in order to satisfy her boundless fascination with all things draconian, even if it means venturing deep into the forbidden jungle known as the Green Hell . . . where her courage, resourcefulness, and scientific curiosity will be tested as never before.